Be the first to hear about their new releases and deals. Download the Booksprout app and search for Jared Garrett today! Jared Garrett is the author of the number one bestselling scifi thriller Beat and a bunch of other lies in book form. He is a family man raising seven kids with his best friend and wife of two decades. He’s been telling stories since he was thirteen and found himself weeping over Bridge to Terabithia. He and his family have been on great adventures and are now back in Utah, where his wife is a full-time law student and Jared is a full-time stay-at-home-dad and professional, designing learning for global corporations. He writes in the margins of the day. Jared had an odd childhood in a nomadic cult, which he left at seventeen. He’s worked as a firefighter, a BBQ restaurant manager, a bellman, and as a rubber vulcanizing engineer, among many others. 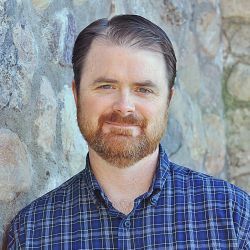 His stories have been nominated for and won several awards, including First Place in the Vera Hinckley Mayhew contest in Utah and Honorable Mention in the Writers of the Future contest. His favorite authors are Stephen King, Terry Pratchett, Robert Ludlum, Katherine Paterson, Douglas Adams, Patricia McKillip, Brandon Sanderson, Dan Wells, Robert E. Howard, Edgar Rice Burroughs, and many more. If you ask him where his story ideas come from, be prepared for a lengthy discussion about inspiration dust, hauling a towel wherever you go, and dogs. Lots and lots of dogs. No, seriously. Dogs.